Compostable heavy duty full length cutlery made with Ingeo. 1000/case in black or white. 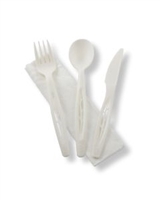 Compostable heavy duty full length cutlery kits made with Ingeo. 250/case in black or white.